Today we’re talking about some of my favourite drugstore brands. The drugstore have some amazing brands to offer these days and some that I will forever go back to more than I would with high end products. The variety they have to offer is outstanding and drugstore brands are really trying to bring out an affordable priced product with high end formulas and I’ve found some brands do really well with this. So, keep reading to find out my favourite drugstore brands and why I love them. I’ve been using revlon products for around a year now and I’ve definitely found some killer products that are brilliant and can definitely be mistaken for high end products. The variety of makeup Revlon offer is outstanding and the formula’s are brilliant. Admittedly, as with most brands they do have some hit and misses but overall I genuinely recommend Revlon. My favourite Revlon products is the Colourstay foundation and the Photoready powder. The Colourstay foundation at one stage was the only foundation I would ever use, it’s got such a high coverage and it glides on perfectly. Generally I use my beauty sponge to buff it in and it leaves such a flawless base and they also have a large variety of colour selection to choose from. The Photoready powder is another win for me, it’s fantastic. I’ve not been using this for as long as the foundation but it’s become a must have product for me. I couldn’t live without it. 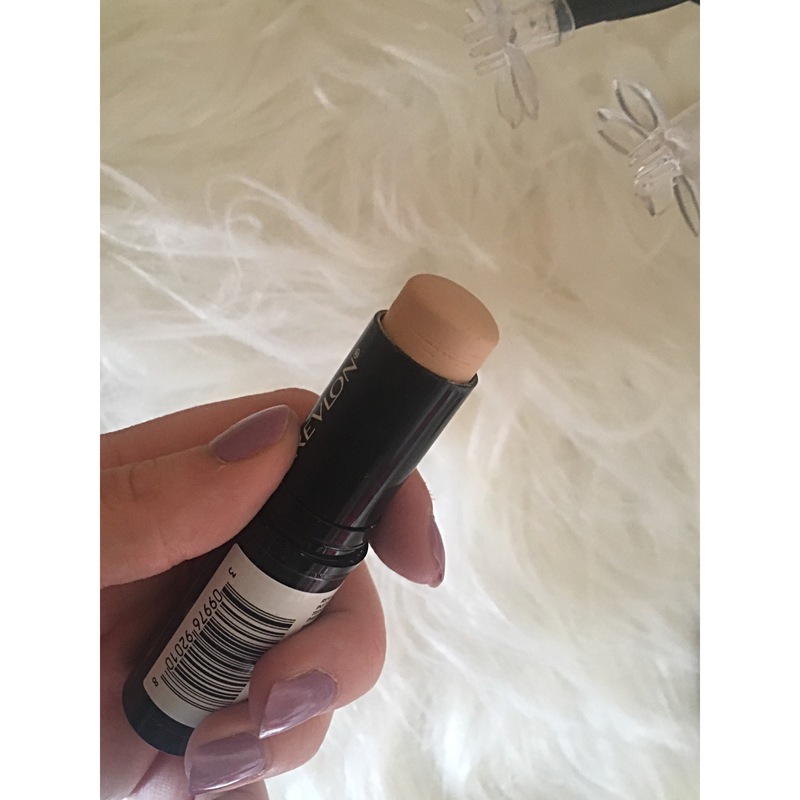 It sits on my face perfectly and doesn’t cake up at all, it’s so lightweight and feels so soft. It also sets my undereye area so well that it doesn’t crease at all throughout the day. Rimmel have been a long time love of mine. I bought my first ever makeup product from Rimmel and have loved them ever since. My first foundation was the Wake Me Up foundation and I often go back to it, I’ve been wearing makeup for around 5 years now and this foundation has been one I always return to. However, this is not why I love them. Rimmel is super affordable and the selection has definitely expanded brilliantly. My favourite products from the range are the Kate Moss lipsticks, their beautiful creamy formula, for me is the best in the drugstore and I always head to their range to look for new lipsticks. They last all day and don’t bleed at all, my favourite colours are the 107 for the Autumn/Winter season and 38 for the Spring/Summer season. I’ve never been a fan of their eyeshadow selections at all and some of their mascaras really don’t do it for me but their nail varnishes are also brilliant and as I said above, their foundations really are brilliant quality for such an affordable price. They’re the ideal first foundation for any person new to makeup. Bourjois have been a recent new love of mine, having been curious to test their products out I finally done it at the end of 2016 and I will never look back. I’ve not tried out everything that I would like to with this brand but I’ve definitely found some amazing products whilst using them. My favourite, go to product from Bourjois is the Radiance Concealer which was my first ever product from them and my go to concealer. It’s amazing, the coverage is outstanding but the best thing is that it’s so brightening under the eyes and super longwearing. I use it to highlight my under eye area, bridge of my nose, chin, cupid’s bow and centre of my forehead and it leaves such an amazing glow to the face. I also love the Black Kohl eyeliner, it’s so good and so easy to blend. It’s actually my favourite pencil liner that I’ve ever used. It’s really longwearing and doesn’t run throughout the day at all. I love to line my upper waterline with this and run it along my lash line and blend it out to create a smokey look. If i’m ever looking for a new eyeshadow palette from the drugstore, I always head straight to the revolution stand in Superdrug. They’re the best in the drugstore and are ideal for makeup beginners. They offer such affordable dupes of high end palettes like the Kat Von D Shade and Light palette, as well as the Urban Decay Naked palettes. They’re fantastic, so blendable and buildable. Really buttery and smooth on the eyelid. I love them. I also think the Iconic Lights and Contour Pro palette is outstanding and an excellent dupe for the Nyx contour palette. For £8 an identical dupe to the nyx palette for such a great price. Their contour shades are my go to and I think they’re fantastic for all skin tones.